This entry was posted on Sunday, July 7th, 2013 at 12:19 pm and is filed under Blog. You can follow any responses to this entry through the RSS 2.0 feed. You can leave a response, or trackback from your own site. I am also using Mnemosyne to memorise chess patterns. Like you, I naturally can’t tell if my subconscious mind is being affected, but am hoping that it will be. Great to hear that you’re having such success with this method! I’m on the verge of starting a similar regimen using Anki. One potential time-saver I plan to use is to not bother inserting the actual position and moves into the program, but simple reference the original source with title and position or page number. For example, a card with “AoA p. 215.” would mean some game on page 215 of Vukovic’s Art of Attack (maybe I’ve marked an exercise position there, or I’m trying to reproduce all the moves from memory). It means I would need to have the source books handy of course. But today quite a few books are available in Chessbase format, and choosing mainly those makes it easier to keep up the schedule when traveling. For example, Everyman has the aforementioned Art of Attack and Hellsten’s now three “Mastering Strategy” books, Chessbase has Dvoretsky’s Endgame Manual (though still only in the 1st edition) and Knaak’s “Mating the King 0-0”, etc. So ideally I should be able to get by with just Anki and Chessbase and maybe a small number of the very best books on paper. Btw. 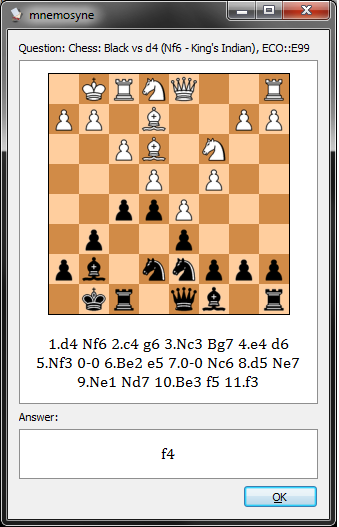 If I want to create proper cards there’s also an add-on for Anki that creates chess diagrams (from FEN notation IIRC). There is also a web site that will take PGN and turn them online into FEN notation. This speeds up drastically the production of flashcards, as PGN files are easy to find. Found your blog link from the Quality Chess blog. Any chance you’d be willing to share your deck of chess problems? I’d really love to try a Mnemosyne-friendly version of the Yusupov and Ivashchenko problems. Hi D., for various reasons I’d rather not, though I am happy to give advice on constructing one’s own. Actually I think a non-negligible part of the benefit from these cards came from making them in the first place, not just reviewing them. Just like d., I found your blog through the Quality Chess Blog. I found your concept very interesting, and perhaps it will be beneficial for me to try. I have a 2250 ELO and hope to get that damn FM-title within a couple of months (I’m 17 and play 100+ ELO games per year). First of all, I downloaded Mnemosyne and just had a look at the program. Is there any program with better graphics and a more modern look, but more importantly is there any program that can sync with Android tablets and Android phones? It would be very nice to do some tactical exercises during lessons and on the subway etc. Second of all, Steven’s idea of converting PGN files to FEN seems interesting. How does this work, what site does this and how do you convert FEN to picture in the flash card program? The main alternative to Mnemosyne is Anki, which seems to have Android support. I haven’t used it so I can’t make an informed comparison. I agree that the subway is a perfect place to do card review! Searching for “pgn to fen” turns up the site http://www.lutanho.net/pgn/pgn2fen.html, which seemed to work okay for the PGN I just tried on it. Probably this is the one Steven referred to. A couple of ways I know of to convert FEN to diagrams are http://www.chessvideos.tv/chess-diagram-generator.php (online) and the program DiagTransfer (Windows only). I see your blog is inactive, but you’re still active over at Stack Exchange. I’ve recently started adding Hellsten positions into my spaced repetitions and I was curious how deep you were taking the solutions? Most of the problems I’m doing the full solution unless the variations go deeper than 10 moves without much explanation. There’d probably be value in trying to understand everything that was going on, but understanding the initial moves/ideas is probably best for this. I’ve been using training mode in Chessbase for these, but I think I will try to get them to work in Chess Hero if I can. I used that software for tactical training sets and it was great for that purpose, probably the best out there. It’s only inactive because I haven’t had much to say recently! For the Hellsten problems I often only include a single move plus the reasoning behind it (e.g., “Exchanging off the opponent’s good bishop”). If the solution needs some tactical justification, or if it’s really a sequence (for example, the third move really has the strategic point and the first two were just setting it up), I extend it out as far as I feel I need to. The point is mainly to improve my strategic pattern recognition and vocabulary, so I don’t worry too much about the tactics. I’d be very interested in getting your decks:) Im perfectly willing to buy the books/provide evidence that I buy them. I’m just pretty daunted by the labor of entering all those fen:) I’m also willing to pay you if you’d like. Hi Joseph, I still would rather keep them private (see my comments above). Sorry if the post seems like a tease. I still think a lot of the value comes from doing it yourself.